By CandidCupcake on June 29th, 2011 . Filed under: Cupcake Ideas . I thought this idea looked fun and tasty for the 4th of July. The cupcakes themselves are made with a yellow cake recipe, and the frosting uses cream cheese with just a bit of lime. 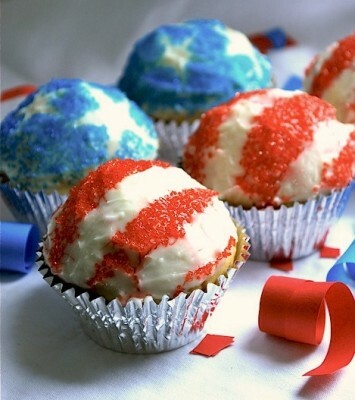 Cut out stars and stripes from waxed paper, lay the templates on the cupcakes, add red and blue sprinkles, remove templates with tweezers, and you have a nicely decorated and patriotic cupcake!